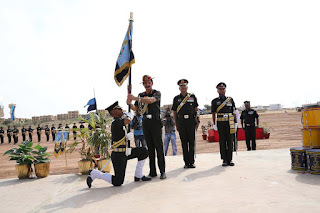 Jaisalmer Military Station witnessed a historic moment on Wednesday, 16 March 2016 when General Dalbir Singh, Chief of the Army Staff, on behalf of the President of India, Pranab Mukherjee, presented the ‘President’s Standards’ to 75 Armoured Regiment and 43 Armoured Regiment. Both the Regiments conducted a mounted parade on the indigenous Arjun tanks with clockwork precision and immaculate co-ordination in consonance with the highest traditions of the Indian Army. To commemorate this historic event, the Chief of Army Staff also released a “Special Cover”. 75 Armoured Regiment was raised in 1972 under the command of Lieutenant Colonel Vijai Singh (Later Lieutenant General). The squadrons of 75 Armoured Regiment participated in the 1971 Indo-Pak war to include the Battle of Laungewala. 75 Armoured Regiment has a unique distinction of being the only unit of Indian Army to be raised on captured Pakistani Territory ‘Sakna’ (26 kilometer inside Pakistan) on 12 March 1972. The Regiment Colours are Canary Yellow over Bottle Green and the Regiment’s motto is “SAHASAM VIJAYATE” which means, “COURAGE WINS”. 43 Armoured Regiment was raised in 1981 under the command of Lieutenant Colonel BM Kapur (later Lieutenant General). 43 Armoured Regiment is the first armoured Regiment to be equipped with India’s indigenous tank MBT Arjun. The Regiment Colours are Sky Blue and Navy Blue. Sky Blue signifies limitlessness and navy blue signifies fearlessness. The Regiment motto is “YUDHYASVA VIGAT JWAR” which means “TO FIGHT WITH A CALM AND DETERMINED MIND”. 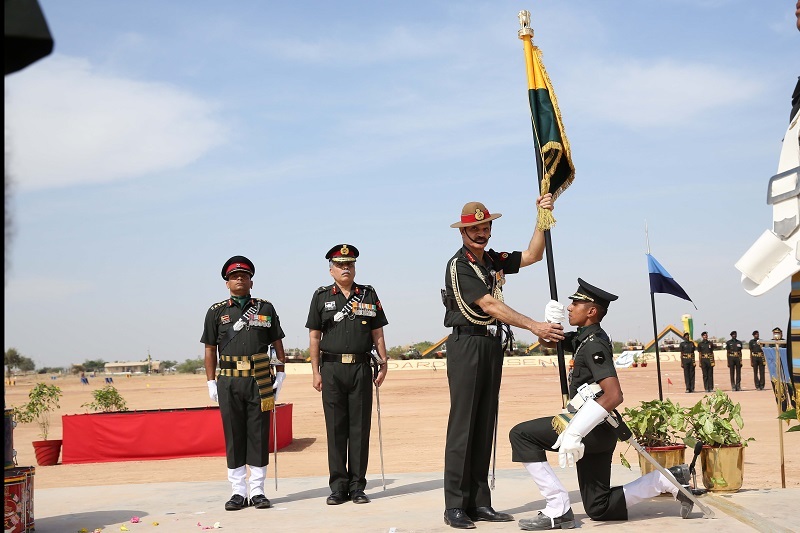 This honour has been bestowed upon 75 Armoured Regiment and 43 Armoured Regiment in recognition of their dedicated and meritorious service since their raising. The Regiments are among the front line Units of Indian Armoured Corps. The hard work and sacrifices made by the valiant soldiers of both the Regiments have been recognized by various awards and medals.